According to NJ State N.J.A.C. 5:10-1.1 and HUD regulation 24 CFR 966.4(e)(1) and 24 CFR 966.4 (e)(4), it is the responsibility of the landlord to provide a safe and habitable living environment. By law, the landlord guarantees that the residential rental property will be maintained in livable condition. Habitability according to law encompasses the element of security in person and property, and protection from foreseeable criminal activity. This warranty applies not only to individual living spaces, but also to areas used in common with other tenants like entryways, stairwells, elevators, and parking lots. Common areas must be reasonably safe for the use of both tenants and their guests. This letter officially advises you as landlord (as HHA Director) and your office that the HHA under your direction has failed to provide adequate protection to me as a tenant, my apartment and vehicle in the HHA parking lot as required by law. Repeated physical threats against me combined with the repeated vandalizing/burglarizing of my apartment and vehicle parked in the HHA parking lot behind 320 Jackson St shows a pattern of inadequacy, failing to provide a safe habitable environment currently and the reasonable expectation from foreseeable criminal activity in the future. 1) Late-June. Car vandalized. The complete mirror panel of my 1992 Plymouth Voyager was ripped off its mount, as was the emblem of my car hood. 2) Late June. Car vandalized. The door latch to my Plymouth Caravan was broken. 3) Late June. Car vandalized. A/C not working. Car’s air-conditioning not working due to damage to the electrical wiring, causing a power shortage. 4) Late June. Apartment vandalized. My apartment was vandalized and the deadbolt lock inside damaged. Several items were later discovered stolen from my apartment. 5) Aug. 8th. Car vandalized. Car rear side door damaged. Back rear window glued shut. My work ID stolen and HHA flyer found placed inside the vehicle in its place. 6) Aug. 8th. Threats to me with bodily injury. An HHA employee threatens me with eviction, “set-up” by police, having my car further vandalized or destroyed outright or having my arm broken because of my skepticism about Vision20/20. 8) Aug. 15th. Threats to me with bodily injury. Ms. Arlette Braxton, President of the HHA Tenant Association physically threatened to do physical harm to me. 9) Aug. 16th. Car vandalized. The car’s relay wires have been pulled out. 10) Aug. 20th. Apartment is illegally entered, burglarized and vandalized again. Chain to the door is damaged and removed. Several items were stolen. 11) Aug. 23th. 2nd Car vandalized. Damage to door handle, gas tank, and scratches to rear window, where Hoboken Resident Parking Sticker is. 12) Aug. 25th. Car vandalized. 2 lawn chairs stolen from car. 13) Aug. 25th. 2nd Car vandalized. Water added to gas tank, rear gasket punctured, causing oil leak, transmission dipstick broken so can no longer pull out. 14) Aug. 25th. Apt vandalized. On 2 occasions, I noticed someone trying to gain access to my apt. By law, a landlord is liable for failing to provide the tenant with a secure and habitable living environment. The repeated patterns of vandalism, burglary, illegal entry to my apartment and car parked on HHA property and the consistent bodily threats against me by HHA related personnel is a breach by the landlord to provide a secure and habitable living environment. The HHA has so far provided inadequate security to my person and property clearly stated in the listed details in this letter. I demand the HHA provide me with a safe and secure living environment as stipulated by law. Talking Ed Note: So far three Hoboken residents connected to the HHA have gone on the record opposing Carmelo Garcia's Vision 20/20. In doing so, each one has said they faced thug tactics: vandalism to property, eviction threats, burglary, and worse. Yet Carmelo Garcia (and his lawyer) claim he's the victim of some imagined contrary Vision 20/20 plan coupled with "ethnic cleansing" put forward by the mayor. No one has seen Carmelo Garcia's Vision 20/20 plan only a concept brochure from 2010 let alone a Mayor Zimmer Vision 20/20 plan. Hoboken residents have been demanding Carmelo Garcia produce ONE Vision 20/20 plan? Has any Hoboken Housing Authority resident received a legal letter with their Bill of Rights as stated in the 2010 Vision 20/20 brochure? It's been three years, why haven't they? Do you think they will fare any better than the people who signed their extinction notice when they answered the door and signed a petition from a smiling Carmelo Garcia, the Applied Housing chosen leader of the tenants association back in 2000? Those residents mostly Hispanic low to moderate income are gone now - thanks to Carmelo Garcia. Carmelo Garcia continues to push his 2010 dog and pony show brochure as if this is a sufficient legally binding plan. It's most certainly not. 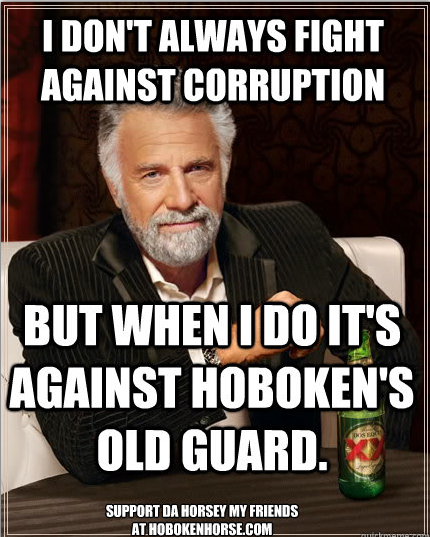 You know it, he knows it and the people of Hoboken know it. 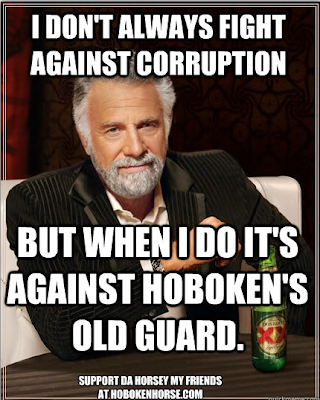 There's thousands of residents in the HHA and over 52,000 in the City of Hoboken. They share one common area of agreement. They are not buying into the scam Carmelo Garcia and his little band of carmelitos are attempting to foster on Hoboken with no review, no input and most certainly no scrutiny. Do you hear any of Carmelo Garcia's friends, political allies such as Michael Russo, Beth Mason, Ruben Ramos, Tim Occhipinti or Terry Castellano offering any semblance of an answer on the numerous questions on Vision 20/20 or as important the terror tactics going on within the HHA when residents raise a voice questioning Vision 20/20/. Which tells you all you need to know about them and Vision 20/20.